Steelhead Trout looks like salmon, but it’s Rainbow Trout that has migrated up the river to spend its adult life in the ocean. Though they look alike, Steelhead Trout’s flavor is milder than salmon. It makes the perfect accompaniment to all the bright flavors of the Roasted Tomatoes and the Celery Salad. Dry the trout with a paper towel. Brush trout with olive oil and season with salt. Heat a sauté pan over medium heat. Add the filets to the pan, cooking 3-4 minutes per side. The fish should easily lift from the pan when you flip. If it doesn’t, just give it another minute or so. 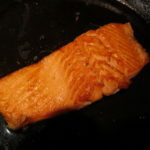 The trout is cooked when you it just starts to flake and is no longer translucent in the center. Drizzle with fresh lemon juice and garnish with fresh dill. Serve immediately. 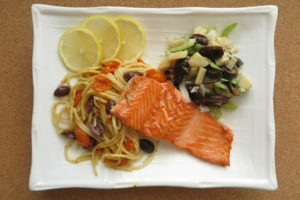 Serve with the Celery & Heart of Palm Salad with Marinated Mushrooms and Pasta with Roasted Tomatoes & Kalamata Olives. Click here to see the Harbor Light Food Article - Winter Refresher.